I’ve developed a bit of an obsession with beets as of late. I didn’t like them as a kid and never really gave them a second chance until last summer when I received some in our CSA. I instantly changed my mind about them; I couldn’t, and still can’t get enough of them. Not only do I enjoy them as a snack, I’m pretty sure beets helped me survive while studying for my PE exam on nights I didn’t have time to make dinner. Weird, I know, but they are delicious. Recently, I started branching out a bit and eating beets with other ingredients. Beets in salads and beets with balsamic vinegar, goat cheese and glazed pecans are two of my favorite dishes. If you haven’t tried beets with goat cheese, drop what you’re doing and go try it. It really is one of the best combinations ever. 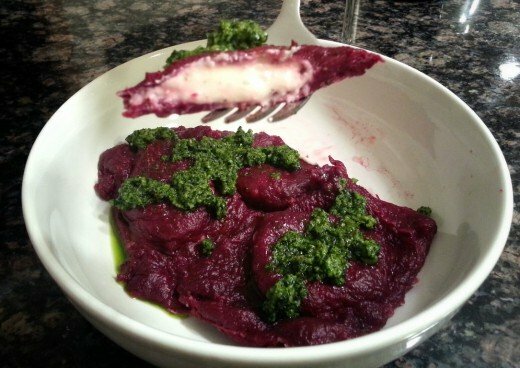 I was browsing on Pinterest not too long ago and saw a recipe for beet ravioli. I was completely intrigued. I had no idea this was a thing and I knew I had to give it a try. I followed the recipe for beet dough and created my own ricotta and goat cheese filling. I also whipped up a batch of basil and kale pesto and served it on top. It was incredible. Preparing the ravioli was time-consuming, mainly because I had never made homemade ravioli before, not to mention homemade beet dough. I learned a few things along the way that should help the process run smoother and faster next time. I’ll be sure to share some tips throughout this post. The first step in making the ravioli is roasting the beets. I used 6 medium to large-sized beets and had more than what I needed. If the beets are smaller, 6 should be about right, otherwise use you might want to use 5. Preheat the oven to 400°F. 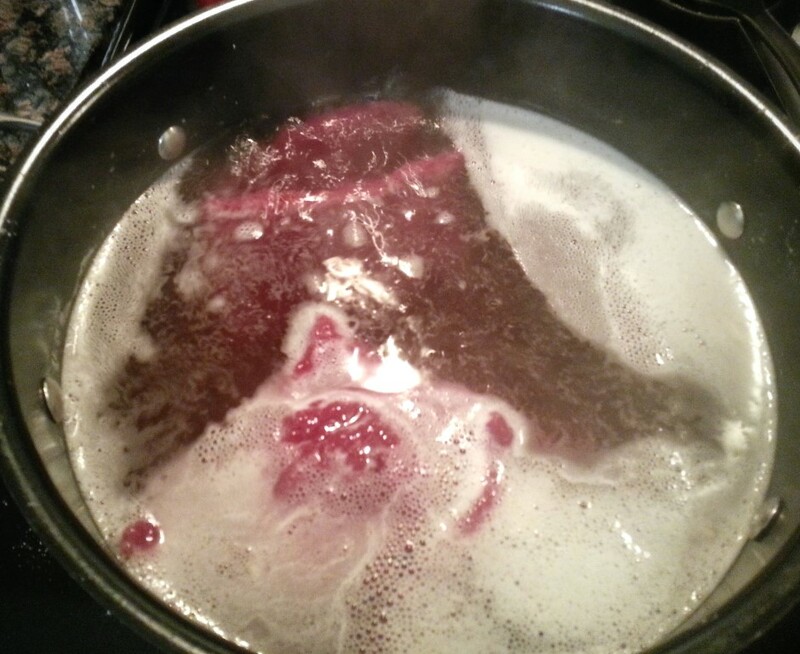 Cut the stems off the beets, then scrub them and rinse clean under water. Toss them in olive oil and season with salt and pepper. Place the beets in a roasting pan and roast, uncovered, for 45 to 50 minutes, or until soft. I roasted mine the night before I made the ravioli to save time the day of. Once the beets are cool, peel the skin off and dice into small pieces. I ended up using a peeler because I was struggling to get the skin off. Next time I make beet ravioli, I’m going to peel and dice the beets then boil them instead of roasting them. I think it should work just fine as long as I allow time for them to sit in a colander and “dry out.” Getting rid of the excess moisture will be important to maintain the texture and consistency of the beet dough. 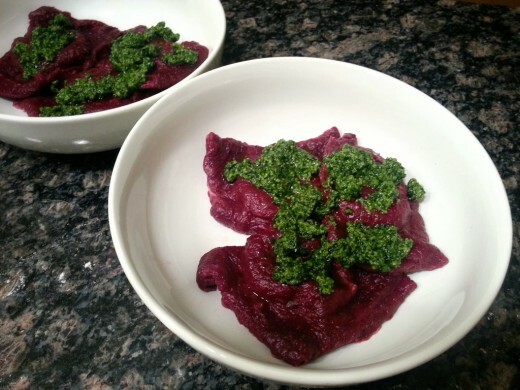 In a food processor, combine 1 cup of the diced, roasted beets with 2 1/4 cups of flour and 1 egg. Pulse until the mixture forms a ball of dough. Carefully transport the dough onto a well floured surface and knead for several minutes. My dough was quite sticky, so it didn’t form a ball in the food processor as you can see. I added in extra flour as I was kneading and it seemed to do the trick. Wrap in plastic wrap and set aside for 30 minutes. 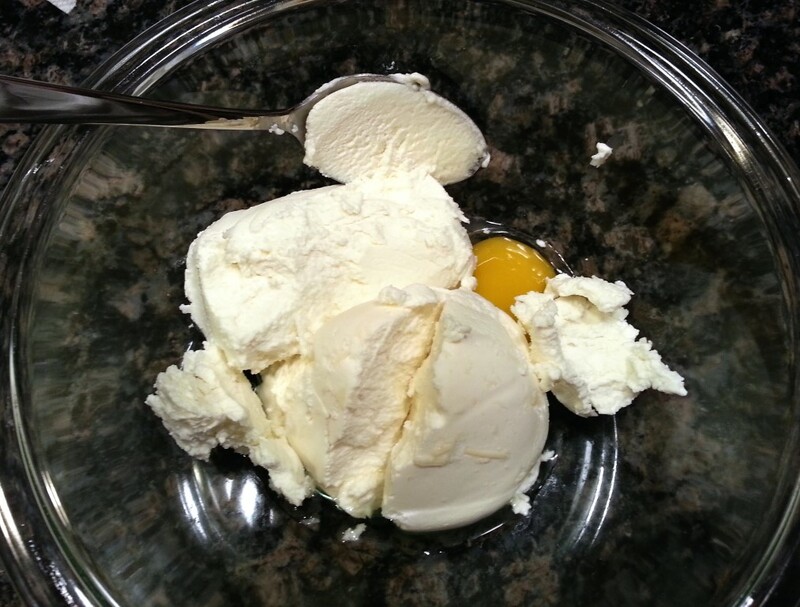 To make the filling, combine 1/2 cup ricotta cheese, 11 ounces goat cheese and 1 egg in a small bowl and mix well. Add in 1/4 cup Parmesan cheese, 1/2 teaspoon minced garlic, and 1 1/2 teaspoons dried basil. Season with salt and pepper. Set aside. After 3o minutes, divide the beet dough into four equal pieces. As you can see below, I halved my dough and ended up with really large, wide pieces. Quartering the dough will produce smaller pieces and will support using a single row of filling (I’ll explain more in a bit). 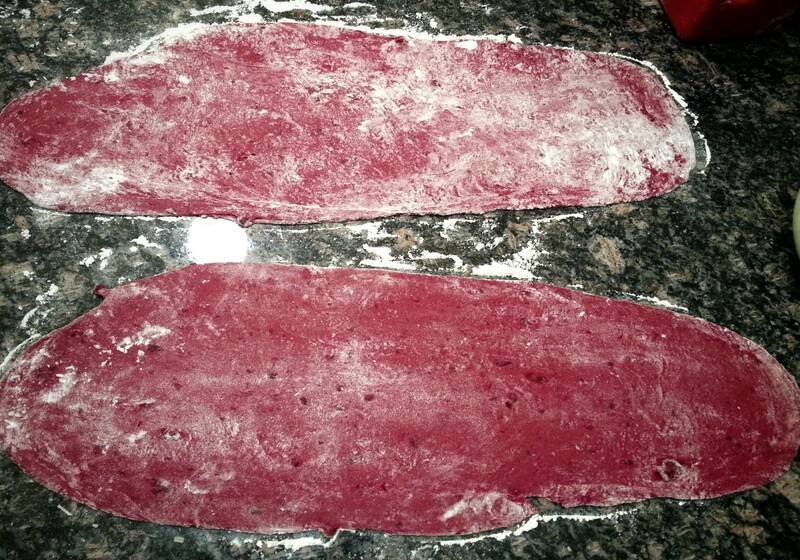 I don’t have a pasta maker, so I used a rolling pin to thinly roll out the beet dough. It worked just fine, but I can imagine the pasta roller would expedite the process and produce “prettier” looking ravioli. You want the dough to be thin, but not too thin or the ravioli filling will burst through. Lay out the four pieces side by side. The filling mixture will be placed on two of the dough pieces and the other two pieces of dough will be used to cover and seal the filling. Begin placing small amounts of filling in a single row along the center of the dough, making sure you leave ample space between each one so the ravioli can be sealed and cut. Because I had such large pieces of dough, I didn’t add the filling along the center in a single row. Instead, I placed the filling in a scattered formation and ended up not having enough room to seal off some of the ravioli. Learn from my mistake; quarter the dough, then place the filling in a single row and leave enough space between each pile of filling. Beat 1 egg in a small bowl to use for an egg wash. After placing the filling on the dough, brush the egg wash around each pile on all four sides. Carefully place the remaining dough on top of the dough with the filling. 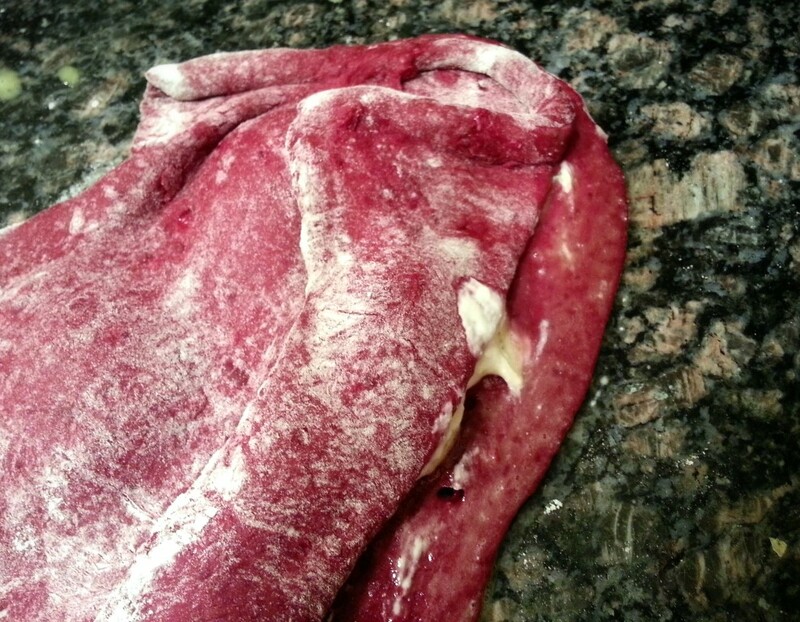 Firmly press down along the egg wash to seal the filling inside the beet dough. 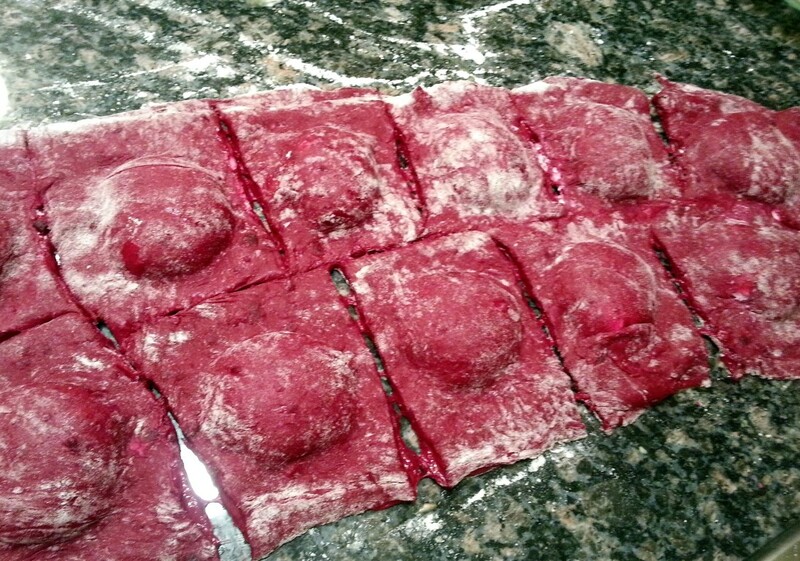 Use a ravioli cutter (or a serrated knife) to cut the dough along the sealed areas to divide into individual ravioli. Bring a large pot of salted water to a boil. Carefully place the ravioli into the water, working in batches (I did about 4 at a time) so they don’t stick together. Cook for 3 to 4 minutes, until the ravioli float to the top of the pot. Use a slotted spoon to remove each ravioli and transfer to a serving plate. Top the ravioli with a fresh, homemade kale and basil pesto, or your favorite sauce and serve warm! Preheat the oven to 400°F. Cut the stems off 6 small beets (or 5 medium sized beets), scrub and rinse clean under water. Toss in olive oil and season with salt and pepper. Roast, uncovered for 45 to 50 minutes, or until soft. Peel the skins off once cool then dice into small pieces. 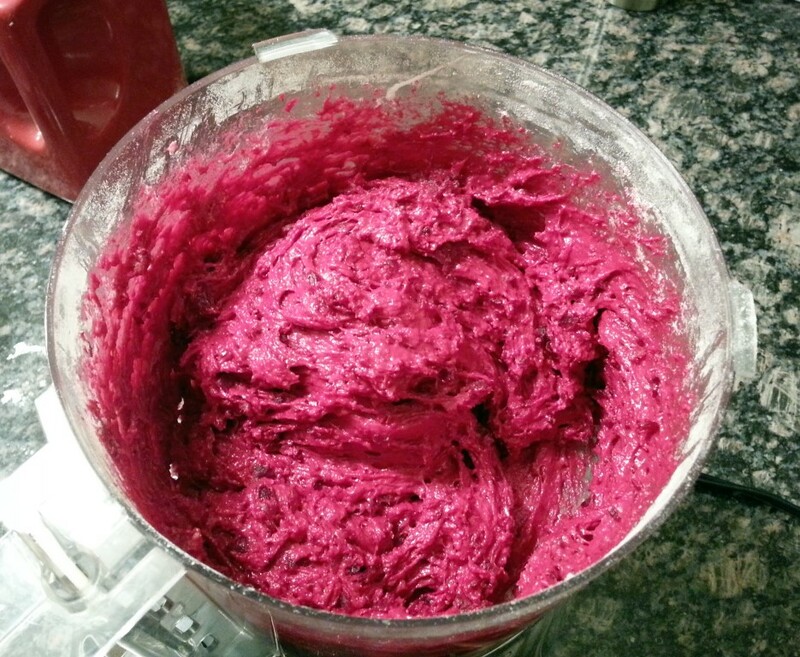 In a food processor, combine 1 cup of the roasted beets with 2 1/4 cups flour and 1 egg. Pulse until a ball of dough forms. Transfer to a well floured surface and knead for several minutes. Cover in plastic wrap and let it sit for 30 minutes. To make the filling, combine the ricotta cheese, goat cheese, and egg in a small bowl. 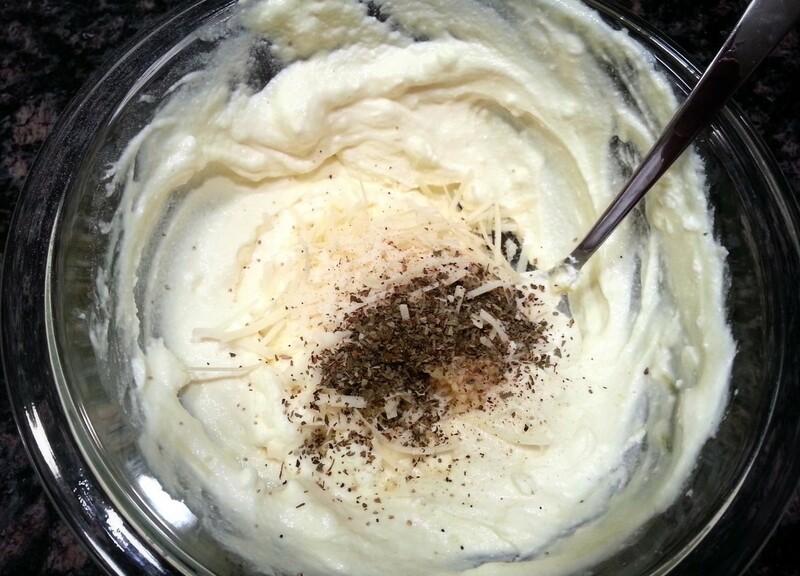 Mix well, then add in the Parmesan cheese, minced garlic, basil, salt and pepper. Set aside. 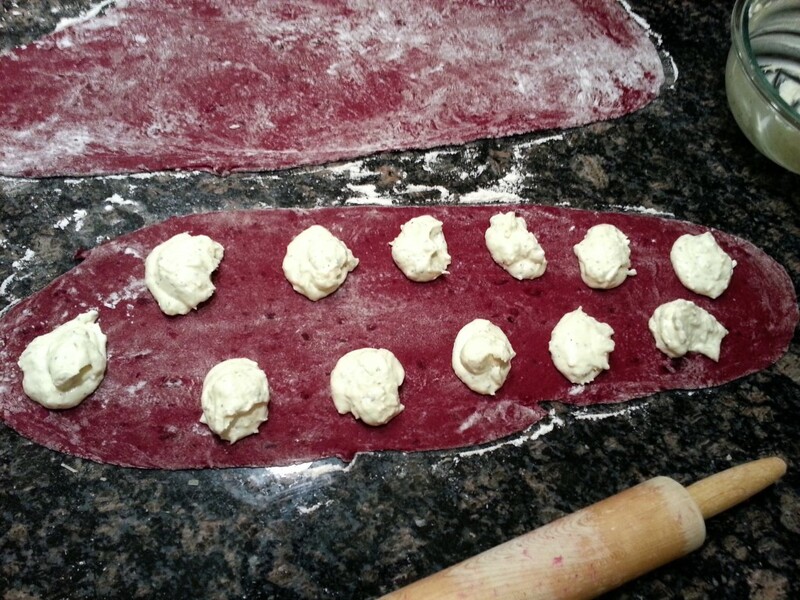 Quarter the beet dough and roll out each piece of dough using a pasta roller or a rolling pin. Place the filling in small piles on two of the dough pieces, reserving the other two to cover and seal the filling in. It's best to place the filling in the center of the dough in a single line, allowing enough room in between each one for sealing. Beat 1 egg in a small bowl to use as an egg wash. Brush the egg wash on the dough along all four sides of the filling. Carefully place the other two dough pieces on top, pressing down to seal along the egg wash.
Use a ravioli cutter or serrated knife to separate the dough into individual ravioli. Bring a large pot of salted water to a boil. Add the ravioli to the water, about 4 or 5 at a time, and cook for 3 to 4 minutes, until the the ravioli float to the top of the pot. Carefully remove the ravioli using a slotted spoon and transfer to a serving plate. Top the ravioli with homemade basil and kale pesto or your favorite sauce before serving.